Aluminum, Silicon, Iron, Magnesium, Manganese, Sodium, Calcium, Phosphorus, Titanium, Potassium, Oxygen, Hydrogen – All this above and some additional elements by a very special secret recipe forms the beautiful colors of this wonderful scenery. Depending on the amount of moisture and the light available , the shades keeps varying thru the day and all seasons. Its a interesting to note that there is not much of flora on the painted hills. 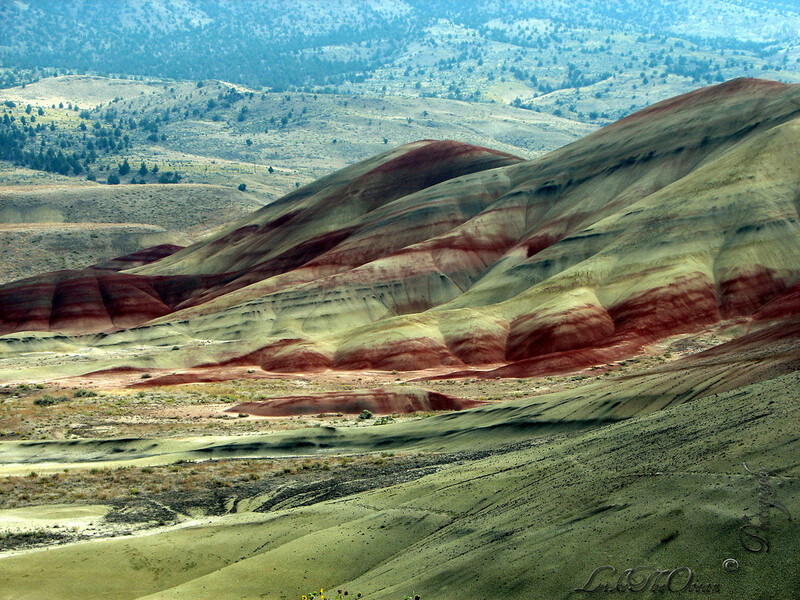 And the reason is more interesting – The clay on the painted hills has a great ability to absorb water and swell. And most of the plant are not able to compete with the soil for water. And the once that do, u can see them in the crevices and gullies of the red hills (the yellow ones that blossoms during the spring are chaenactis and bee-plant. For the Flowers view of the mountain check this out !!! Yes, I actually originally googled this picture to find out about the chemical composition…your blog is wonderful.